Transporting your bicycle is made easier with a good rack system, such as those made by Saris, Thule and Yakima. Which one is best for you? Your ideal rack will depend on how many bicycles you want to carry, where you want to carry your bike (On the roof of your car? Rear of your car?) and what features are already on your vehicle (Roof rack? Hitch?). We will work with you to determine what you need to fit your specific vehicle. We keep some of the standard rack systems in stock, and can order whatever you need. Perhaps most important, we can show you how to install these racks on your vehicle, and how to securely attach your bicycle; our back-door parking spot is ideal for working on your bike rack. Choosing your helmet is all about comfort. All of the bike helmets we sell meet all industry standards for safety, so all you have to worry about is finding one that fits you well. 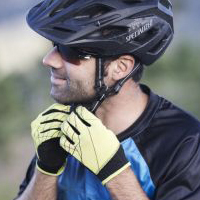 Some helmets come in one or two sizes, then have adjustments to make them fit your head, while others come in several sizes so you don’t have to adjust as much. Helmets will also vary some in the style of fit system, ventilation, visor and weight. If you’re not used to wearing a helmet, talk to one of our staff members to make sure yours fits well and you’re wearing it the right way (level on the top of your head, not tilted back, exposing your forehead). The bottom line is: find a helmet you like, and WEAR IT. Staying hydrated on your ride is important and can be easy if you plan ahead and have the right gear. The standard solution is to install a bottle cage (or two) on your bike frame and refill your bike bottles before every ride and at every opportunity on the road. Instead of bottles, or sometimes in addition, many cyclists carry a hydration pack, which allows them to drink more frequently and easily and can also carry up to 3 liters of water. Hydration packs will also provide carrying space for tools, food, and extra clothing, depending upon your needs. We carry dozens of hydration packs and many different styles of bike water bottles, including the Specialized Purist bottle, judged the best bike bottle by Velo News. Lights on your bike can serve two purposes: to allow cars to see you, and to light up your path for you to see the road ahead. 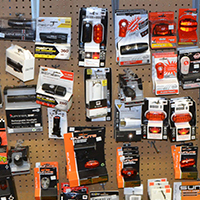 To be legal and to be safe, you need a good headlight and taillight on your bike (Kansas state law requires a front headlight after dark). If you’re looking for a light truly capable of lighting your path, you’ll want to seek some of the higher powered lights capable of producing at least 100 lumens. These have improved greatly with the advent of a better LED bulb and rechargeable battery technology, providing big light in a small package at even more affordable prices. We also have a pitch dark place to test them, so you can compare their performance as you make your selection. If you like your bike, you should have a lock you trust. We carry several models of u-locks, as well as several styles of cable locks. Depending on which features are most important to you – security, weight, versatility, cost – we’ll help you find a lock that will fit your needs. If you are a cycling enthusiast interested in maximizing performance and/or comfort, then a good pedal and shoe system is critical. 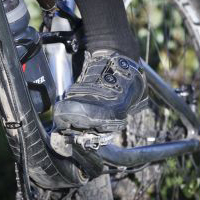 Referred to as “clipless” systems, the term means that these systems hold the foot to the pedal without using the old-school toe clip and strap system. There are different clipless pedal designs for different styles of riding. Come in for a thorough explanation of the options available. And if you purchase your shoe and pedal system from us, as part of that purchase we will mount and align the cleats in their optimal position. Whether you’re going on a long-distance bike tour, running errands, or if you’re a daily commuter, you need a rear rack and pack on your bike to carry your gear, groceries, or lunch. And even the short-distance rider should have a small pack for basic repair and emergency items. 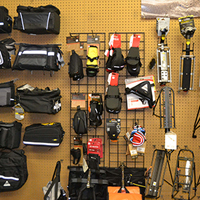 We have all of these and more, and will be eager to talk with you about the advantages and disadvantages of the different sizes and styles of bike bags available. Flat tires are a part of bicycling, but if you’re prepared with a good bike pump, they won’t slow you down for long. A reliable floor pump is a must-have for any bike owner, so that you can keep your bike tires pumped to the right pressure before you ride, making your ride more efficient as well as protecting the rims and tubes. For rides outside of town you should have a small pump or CO2 inflator that fits onto your bike frame (or fits into a backpack or bike pack) so you can take care of flats on the road. Finding a saddle (bike seat) that fits you will improve your riding experience. We have a wide variety of saddles to choose from, including saddles for road riding, mountain biking, kids, and comfort bikes. And when you purchase a new bike from us, you can trade up to a better saddle if you prefer, and just pay the difference. 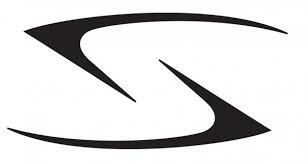 We recommend Specialized saddles because of their unrelenting commitment to rider comfort and safety. We can measure your sit bones in order to match you to the correct width saddle as well as matching the saddle to your bike and riding style. Keep your tires in good working condition by storing your bike in a dry place, hanging from a hook (not sitting on the ground) and keeping your tubes inflated. But even the best tires in the best conditions will wear out eventually. When that happens, we can help you replace your tires with similar models or help you upgrade to better tires. We keep dozens of models of bike tires in stock, and can order others if we can’t find the right one for you in the store. In Kansas, tires that have built-in flat protection are almost a must and we carry tires from Continental, Specialized, Vittoria and others featuring a variety of levels of protection. Which bike repair tools do you really need? This will vary greatly depending on your comfort level in doing repairs. Most bike owners will want the tools to repair flat tires, others will want to adjust gears and brakes, and others may want to work on the bike chain. And you may consider maintenance items like cleaner and lube as “tools” to prevent future problems. 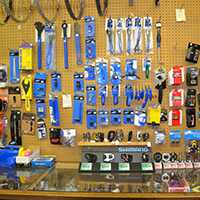 We keep a wide variety of tools for you to choose from, and our bike mechanics can give you advice about which are the basic needs for non-technical bicyclists, and which tools might be a good place to start if you want to do some work on your own bike. If you want to stay in good riding shape throughout the winter, but aren’t interested in braving the cold, consider an indoor bike trainer. Bike trainers can turn your bicycle into a stationary bike for indoor riding, allowing you to ride the bike you love in any weather. Several options are available, and they vary in price as they offer less noise and more realistic resistance. Wind trainers are the most basic types, but can be loud. Magnetic and fluid trainers are preferred by most cyclists due to the quiet mechanisms and the ease of use. If you want to try one, we usually have at least one set up with a bike so you can feel how they work. Best of all, they fold up and store easily so they won’t take up lots of space between rides. We keep tubes of all sizes in stock all year long, from small wheel diameters to fit strollers and joggers to large wheel diameters for road bikes. For most of the basic bike wheel sizes, we keep regular thickness tubes, the extra-thick puncture resistant tubes and Airlock sealant tubes in stock. Tire liners are often the best option for avoiding flats as they have less weight than puncture resistant tubes and a longer lifespan than sealant tubes. We stock wheels ranging from the most basic steel repair wheels to high performance racing wheels and many styles in between. Experience is always the best knowledge. Our tips are the best resource for ensuring your enjoyment in the outdoors.